I was born and live in Croatia. 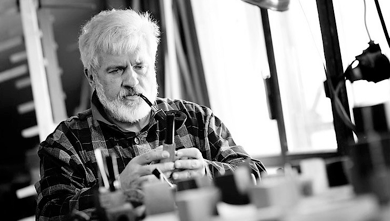 I have been engaged in pipemaking for fifteen years and in the enjoyment of pipesmoking for the last thirty-five years. A few years ago I got to know my present companion, Darko, top master carpenter, who for some time now has been collecting and processing semi-petrified oak wood (abonos, bog-oak, Mooreiche, morta). As a result of our collaboration, pipes made of this material also started to come to life. As expected, like any hobby pipemaker, I began working in briar, mostly from the Adriatic coast, I followed working in olive wood, and now, as a peak, in morta (in pipesmoker’s world this type of material is commonly termed morta). I sell a lot of my pipes, but I also like presenting them as a gift to my friends. My domicile country is rich in natural resources of all materials of which pipes are made nowadays (briar, olive-wood), while in history it was one of the largest manufacturers of clay pipes. So in Croatia top briar, olive-wood, and various sorts (colours) of morta, including “golden”, “copper”, and black, can be found. currently I am preparing “red” and “blue” morta, as a very rare kind. Unfortunately, these days the tradition of pipe smoking in the whole world has been reduced to a smaller number of enthusiasts, a few of whom regularly meet in our Society and Club in Zagreb. I am also president of Association of Pipesmokers “Lula” (Pipe). And just to mention, in a “real” life I am a manager in a foreign company’s branch in Croatia. My pieces are signed by the letter “D” stylized from the old Slavic Glagolitic script – Glagoljica, impressed with a hot stamp. Glagoljica is an Old Slavic alphabet created by the mid 9th century, which remained in use in Croatia until the 19th century. The tradition holds that the script was invented by St Cyril (by the real name of Constantin), a Byzantine monk from Solun (Thessaloniki). In this way I wanted to create a symbolical connection between old material, morta, and the oldest script of the Slavic people.